Heads up St. Catharines, Morningstar Mill is helping meet Mayor Sendzik’s vision of making St. Catharines the most livable city in North America! 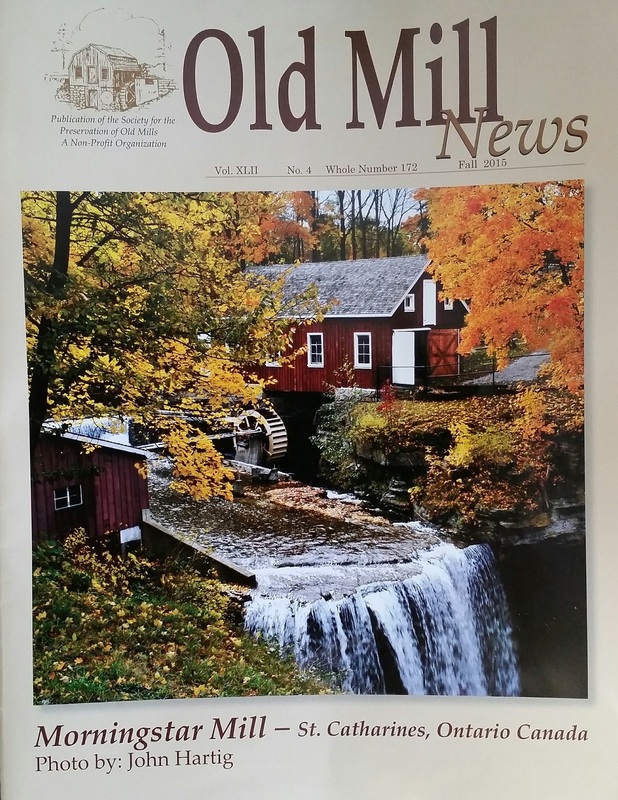 Morningstar Mill is featured in the latest issue of Old Mill News, published by the Society for the Preservation of Old Mills (www.spoom.org), an organization based in the US! The organization also awarded Morningstar Mill a grant which helped pay for new interpretive signage inside the mill! Decew Falls is named after John DeCou, an early landowner who settled in the Townships of Thorold and Grantham in about 1788. During the War of 1812, he served as a Lieutenant in the Second Regiment of the Lincoln Militia, and it was to his home that Laura Secord brought news of an impending American attack in June 1813. After the war, DeCou built a stone grist mill with an overshot waterwheel at Decew Falls. The mill and DeCou’s other businesses prospered and the area became known as Decew Town. The construction of the First Welland Canal, however, left the mill without an adequate water supply and this prompted DeCou to sell his home and property in 1834. Over the next 30 years, the mill slowly fell into a state of disrepair. By 1872, Robert Chappell had built a new grist mill at Decew Falls called Mountain Mills, using some of the remaining stone foundation walls of John Decou’s mill. Unlike Decou’s mill which had been powered by a waterwheel, Chappell’s mill was powered by a turbine. The turbine is located at the bottom of a 40 foot pit which was blasted out of solid rock beside the falls. A stone dam constructed across Beaverdams Creek formed the mill pond, and an iron pipe directed a steady flow of water from the mill pond to the turbine. The spinning turbine sets the machinery inside the mill into motion. Robert Chappell’s mill was successful from the start; however, in 1875, the City of St. Catharines began work on their new waterworks and Beaverdams Creek was dammed just above Decew Falls. To prevent damage claims for loss of water supply, Mountain Mills was purchased by the St. Catharines Waterworks Commission. With the completion of the Third Welland Canal, a consistent flow of water to the mill was restored, and Mountain Mills was sold to Wilson Morningstar, which accounts for the mill’s alternate name today, Morningstar Mill. Wilson Morningstar operated Mountain Mills from 1883 to 1933. He ground wheat into flour and chopped oats, corn, rye and barley into animal feed. In November 1892, a fire destroyed the interior of the grist mill. This gave Wilson the opportunity to update his milling operation with the latest equipment – a two-break three-reduction Greey Roller Mill system which produced white flour. At the time, roller ground white flour had become very popular for baking because it was whiter and finer than flour made with traditional millstones. He also purchased a grain cleaner, a corn cob sheller, an oat roller and an attrition mill for grinding grain for animal feed. About 1911, when a doctor told Wilson that whole grain flour was healthier than white flour, Wilson installed a pair of traditional millstones which were purchased second-hand from Maple Leaf Mills in Thorold. The Morningstar’s home was built about 1895 by two carpenters from Thorold with lumber that Wilson had sawn in his sawmill. The house features scalloped clapboard siding, and ball and spindle gingerbread. When the house was first built, it was heated with wood in the spring and fall, and coal in the winter. Drinking water was retrieved from a well, and water for cleaning and washing was collected in a cistern. Wilson seemed to keep his family and home up-to-date with the latest advancements. From about 1904 to 1914, he produced his own electricity for lighting the mill and house, and in about 1918, he renovated one of the rooms in the house and installed a three-piece bathroom with indoor plumbing! By 1930, Wilson had gradually shut down his flour milling business. After Wilson died in 1933, Wilson’s family continued to produce animal feed for local farmers on the occasional weekend for a few years until the turbine seized. Wilson Morningstar and his wife, Emma, occupied the house throughout their lifetimes. When Wilson died, Wilson’s oldest daughter and her family moved back into the house, and her children (Wilson’s grandchildren) lived in the house until 1991. Wilson’s granddaughter, Lorna, bequeathed the contents of the mill and house to the City of St. Catharines in 1994. A milestone was reached in November 1996 when a volunteer group called the Friends of Morningstar Mill produced stone-ground flour using the restored water-powered turbine and Wilson’s grinding stones. After 60 years of silence, Wilson’s mill rumbled and the smell of flour filled the air. The Morningstars home was also restored and showcases many pieces of furniture that were owned by the Morningstar family dating up to 1933. Today, Morningstar Mill is one of the few mills in Ontario that houses all its original equipment, and operates its millstones using its original water source. The operation of the mill and the conservation of the buildings and property are made possible by the City of St. Catharines and the ongoing efforts and support of the Friends of Morningstar Mill and the community.